With all the focus on autonomous learners, it's only a question of time before the flipped classroom becomes the norm. Although it's a relatively new concept, there have been a number of books written about the flipped classroom. It has students learning outside the classroom as well as inside. It's a type of blended learning. 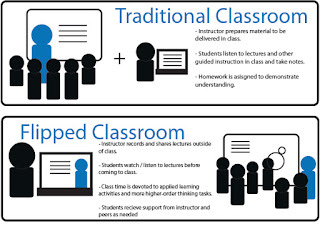 The flipped classroom takes the focus off the teacher and becomes student centered. A great example of the flipped classroom is Khan's Academy. Technology is often used. Activities that are usually used for homework are used in class. Examples of this are peer-editing and PBL (project-based learning). The goal of this is to allow students to apply the knowledge they have learned rather than just regurgitate it. Students problem solve, work in groups, and do research. The teacher isn't seen as all-knowing, but rather as a guide. Students are more actively involved and motivated and take charge of their learning. 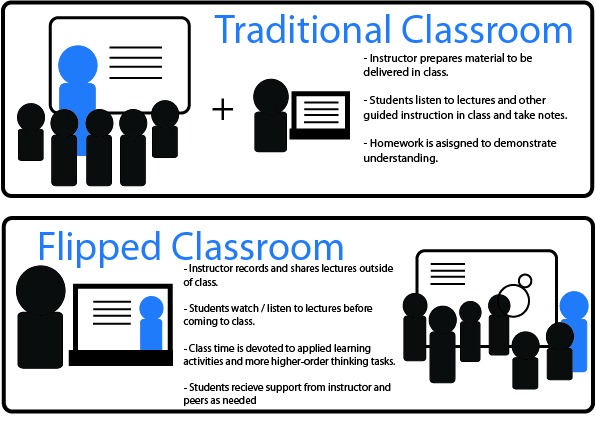 Studies have shown that students in flipped classes outperform those in traditional classes. There are pros for teachers as well: no daily lesson plans and no grading papers. Students are also able to choose how they want to be assessed. This allows them to work with their learning styles. Just because some students test well and others don't doesn't mean that the latter don't understand. They can choose a test, an essay, speaking, or even making a game. If you're interested in learning more, #ELTchat has had two discussions about flipped classrooms: the flipped classroom and flipped learning in English language classes - what's the best use of your face-to-face time in class?